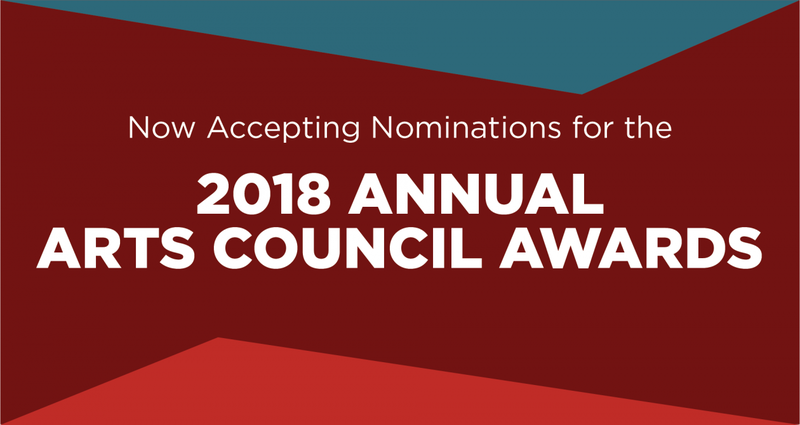 We are now accepting nominations for 2018 Annual Arts Council Awards! Access the nomination form here. The Wichita/Sedgwick County Arts and Humanities Council established the Annual Arts Council Awards in 1969 to recognize and honor those businesses, foundations and individuals who have displayed consistent and exemplary support of the arts and humanities in Wichita/Sedgwick County. These awards focus attention on the importance of the arts as they relate to the quality of life in Wichita/Sedgwick County and honor those who have made major creative achievements or significant contributions to cultural growth or development. Nominations must be received in the CityArts offices, 334 N. Mead, by 5:00 p.m. Friday, August 10, 2018. Nominations will not be accepted after the deadline. Gordon W. Evans Award – Given to a patron demonstrating outstanding leadership and special support for the arts. Arts Organization – Given to a public, not-for-profit organization that presents or provides arts opportunities to the Wichita community and region. Special Project – Given to a neighborhood, business, corporation or group that has provided support for a single event or project. Arts Educator – Given to an individual who has devoted a career to teaching the arts in an educational environment. Arts Advocate/Individual – Given to an individual or couple dedicated to furthering the cause of an art form or the arts in general through promotional, volunteer, administrative, legislative or professional efforts. Arts Advocate/Group or Business – An organization or business dedicated to furthering the cause of an art form or the arts in general through promotional, volunteer, administrative, legislative or professional efforts. Individual Artist – Given to an artist actively working in such categories as Choreography, Music Composition, Film/Video, Theatre, Interdisciplinary/ Performance Art, Two-Dimensional Visual Art and/or Three-Dimensional Visual Art, who has shown outstanding achievement. Youth Recognition Award – Given to a high school and/or middle school student who has shown outstanding achievement and development in the arts. Burton Pell Award – A new award created in memory of Mr. Pell a long time member and past president of the Arts Council. It will be given to an outstanding individual in music. Any individual, business, organization or institution currently residing in Wichita or the surrounding area involved in arts and cultural activities located in the area at the time of nomination is eligible to be nominated. Ineligibility includes any self-nominations, posthumous nominations and previous Arts Award winners. If needed, the Arts Council will make decisions on any unusual circumstances that might occur after the nomination committee has met. Nominations are accepted from Kansas citizens and organizations seeking to recognize individual artists, art educators, advocates, organizations, individual patrons, and patron organizations. Nominations may be submitted with or without the knowledge of the nominee. Award recipients will be chosen from among the nominees by the nomination committee, which will include members of the Arts Council. At the discretion of the panel, selections may include more than one award in a category. Conversely, the panel may decide not to give an award in every category if the total ranking does not merit an award. • Length of time and intensity of activity dedicated to the arts. • Contributions to excellence in the arts. For further assistance or information in preparing this form, contact Bernadette Bradshaw by email or by phone at (316) 303-8663. Access the nominations form here, or see the list of Art Awards winners from previous years.